Grand Canyon National Park, a World Heritage Site and one of the Seven Natural Wonders of the World, is a top family travel destination and a must see, at least once. And it offers something for everyone. Take a day trip to the South Rim or Grand Canyon West and take in the beauty and magnitude of the Grand Canyon. Spend a week or more and explore. Take a train, plane or helicopter tour. Hike, raft, or take a mule ride along the canyon floor. Enjoy the view from above on the recently inaugurated glass-bottom Skywalk. Experience the backcountry on the Grand Canyon North Rim. And if you're traveling with older teens ready to test their survival skills, make the journey to Toroweap, also known as Tuweep, and enjoy the best views from the rim. A Grand Canyon vacation can be as brief or as adventuresome as you desire. Stretching 277 miles (446 km) and spanning up to 18 miles (29 km) across, there is no other canyon in the United States, or elsewhere, that is quite so large. 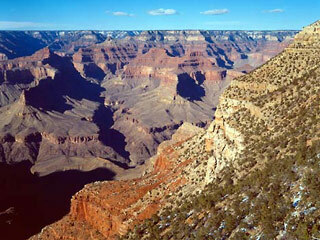 But the Grand Canyon's significance goes beyond its size. Here, one can fully appreciate the power of erosion over 2 billion years and take note as the area's history unfolds. Rocky gorges plunging one mile (1.6 km) to the canyon floor. Cliffs and pinnacles aptly named after mythical heroes, Wotan's Throne, Brahma Temple, Isis Temple and Cheops Pyramid. Multiple layers of strata each belonging to a different time and, in many ways, a different place. Ruins and artifacts left by Pueblo communities and desert cultures that once inhabited or passed through the Grand Canyon. Toroweap and the North and South Rims lie within the Grand Canyon National Park. Grand Canyon West is located in the Hualapai Indian Reservation and is not managed by the park. Once off the beaten path, the West Rim is quickly becoming a hotspot. In summer, the crowds at the South Rim and can be unbearable but nothing that a short hike from the major overlooks and shopping strips can't fix. The remoteness of the North Rim substantially limits the throng and ensures that a trip here is all about nature and the great outdoors. And Toroweap, due its rugged nature, is almost empty at any time of the year.